The low pressure area that went through Northern California yesterday is now over Nevada and moving eastward. Today there will be a few clouds over the mountains north and east of the valley with isolated snow flurries. Clearing all areas and cold tonight. 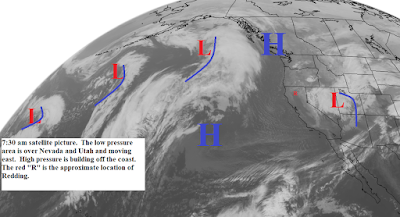 Tuesday high pressure will be along and over the west coast and is expected to hold there for the next 7 to 10 days (see map below). During this time the north state will be mostly clear with above normal daytime temperatures and periods of locally gusty north winds.